As anyone who has seen The Martian (or better yet read the book by Andy Weir) knows, once the many issues of getting to Mars have been solved, actually surviving on the Red Planet is a whole new kettle of fish. Mars has a harsh environment with extreme temperatures and high-energy radiation, so where early explorers will shelter and live is of top priority, especially as it is likely they will be there for months. With that in mind, NASA gathered together experts, architects, and designers at its Langley Research Center in Virginia to brainstorm ideas for a possible Mars habitat, including which materials would be best for building. The best solution they came up with? Ice. 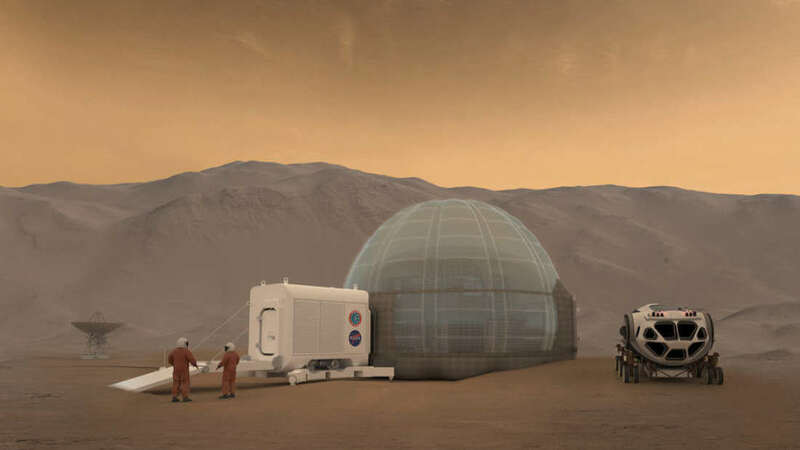 Their design proposal, as you can see in the concept art above and below, is the Mars Ice Home, an igloo-style inflatable dome that will be covered in a thick layer of protective ice. “After a day dedicated to identifying needs, goals and constraints we rapidly assessed many crazy, out of the box ideas and finally converged on the current Ice Home design, which provides a sound engineering solution,” said Kevin Vipavetz, a senior systems engineer at Langley, in a statement. Again, for anyone who has seen The Martian, the concept art won’t look too unfamiliar as it resembles the “hab” Mark Watney takes refuge in, being lightweight and inflatable. The major improvement is the use of ice to shield the astronauts from the cosmic radiation that Mars’ atmosphere does not protect against, while also allowing natural light to pass through. “All of the materials we’ve selected are translucent, so some outside daylight can pass through and make it feel like you’re in a home and not a cave,” explained Langley Mars Ice Home principal investigator Kevin Kempton. The materials used to build these Ice Homes will need to stand up to Mars’ challenging climate, including ultraviolet radiation, charged-particle radiation, atomic oxygen, and dust storms – though the NASA scientists are keen to point out that nothing as strong as the storm featured in The Martian would actually happen. The other major reason for using ice is to use materials already found on Mars, making the habitats easier to transport and cost effective. The design means water ice will be used to fill the translucent pockets on the outside of the habitats, while a cellular layer of carbon dioxide obtained from the Martian atmosphere would be used to insulate the inside of the habitat from the ice. That humans will one day reach the Red Planet is not in question anymore, it’s more a matter of when or who will get there first. Whether it’s NASA’s plan to put humans on Mars by 2030 or Elon Musk’s desire to set up a colony there by 2060 – the more prepared we are for that day, the better.